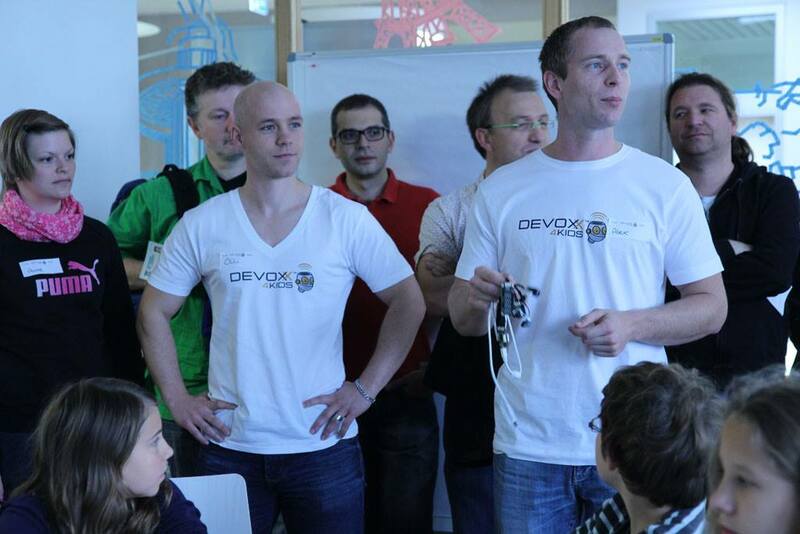 Last weekend, on 27th September, the devoxx4Kids took place in Karlsruhe (Germany) and I was fortunate to be part of it. Togehter with my girlfriend Anne Doege, Alexander Bischof and Sascha Binger we prepared a workshop about “The Internet of Things” with Tinkerforge. Sven Ruppert spread the idea of a Tinkerforge session on the devoxx4Kids throughout his many talks held for various user groups and gathered the volunteers for our team. We introduced the Brick Viewer to the kids, so they could get a feeling of how the single elements work and additionally we prepared a set of tiny programs, which enabled the kids to grasp the the features created by the combinations of the bricklets. They learned about morse code, displaying numbers (and even some letters) on 7 segment displays and how they could build their own park distance control. We have also prepared a riddle for the kids to solve. They had set a certain value on the rotary poti and additionally hold a certain distance for the IR bricklet. We provided them with the values they had to set. However, they needed to conclude, that they need the Brick Viewer in order to check for proper values. The advanced kids then modified the riddle by changing the the values they had to set. As soon as the our material is publicized, I will add a link to it. It was an amazing experience to work with the kids. They were so clever and interested. I am looking forward to the next Devoxx4Kids.